The dark days of the competition barbeque off-season are almost behind us. Soon all the various BBQ internet forums will be abuzz with preparations for our version of the NFL season. Oh, how I love spring! Given this, I am going to start a series of posts to address the first-time competitor. This year will only be my fourth competition season, so I vividly remember what it's like to be a newbie. I strongly feel that we veteran competitors should 'pay forward' what we've learned to help the next generation, so to speak. 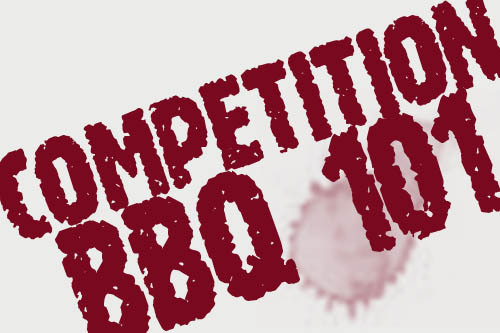 I'll start this "Competition BBQ 101" series with my competition gear checklist. This is a comprehensive list of the stuff you will need, but there are some optional items. You will need to develop your own list as you gain experience. It's very much a process of trial and error, but this list includes everything you will need. Weather is often a huge factor at competitions, so pay particular attention to what additional stuff you might need to stay warm/cool/dry and comfortable. I developed the checklist using the Smokin' Guns version as a starting point. My version covers both the "I have it" (H) and the "I've loaded it" (L) aspects. I use it as both a shopping/locating list and as a packing checklist. It also helps to take the checklist with you so that you can cross out items that you don't need or use. Your first time packing up after a competition will underscore this point. The main point is not what checklist you use, but that you use one. Competition cooking is stressful enough as it is. You don't need the added stress of forgetting some gear in your rush to hit the road. I religiously use this checklist, even after three years of competing. 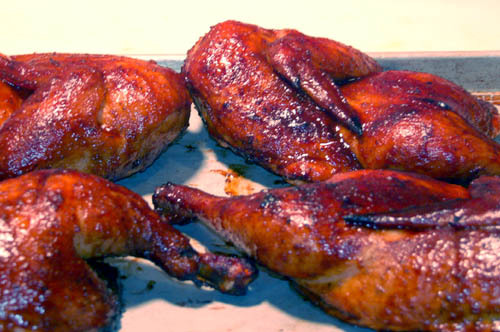 Here's a step-by-step process to barbequed chicken nirvana. It looks like a lot of work, but it's really not. Let's dive right in. Click the images for larger versions. 5 cups (approximate) of your favorite marinade. Of course, I recommend mine. Start with a large clean cutting board. Remove your chicken from its bag. Pull the neck and innards from the cavity and rinse well (inside and out) with cold water. 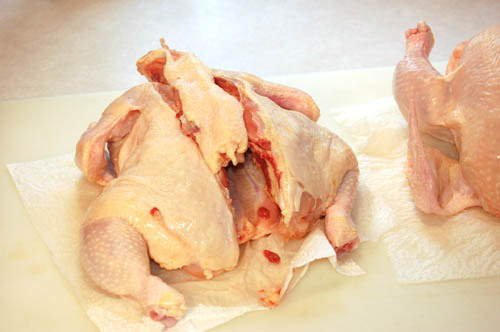 Shake off the excess water and set the chicken on a double layer of paper towels on the cutting board. 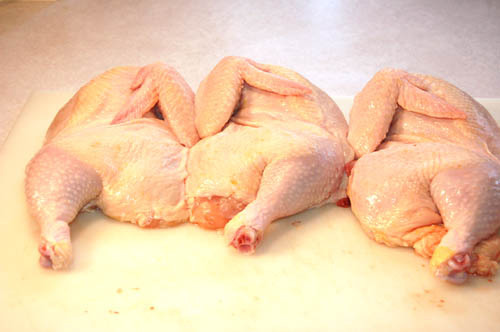 Turn the chicken over so that the back is facing you. Cut completely through the rib cage about 1/2" on either side of the backbone. This is where kitchen shears are highly recommended. Be very careful if you are using a knife. Discard the backbone, or keep it to make broth or stock. 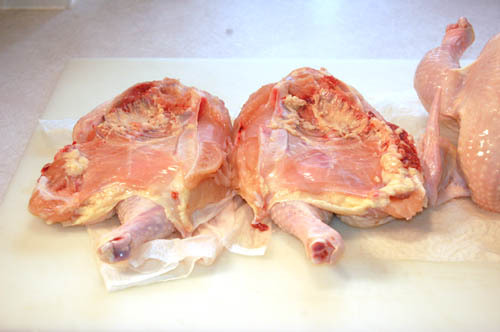 Push the two halves of the chicken apart to expose the breast (keel) bone. Slide your index finger under the bony part of the keel and pull toward you. If the bony part separates from the cartilage portion (which is likely), just cut gently along either side of the cartilage and coax it out. Use the knife to completely separate the two halves. Rinse each half and pat dry. 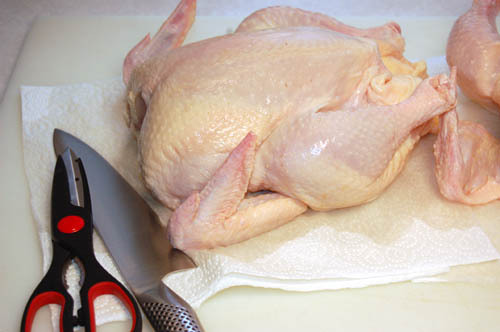 If you skip the cutting part and just flip the bird over and flatten it, you'll have a nicely butterflied chicken. I prefer to separate the halves because it's easier to handle when cooking. You'll have to separate them when carving anyway. Put each chicken half in a gallon zip-top bag. Add 2 1/2 cups of the marinade to each bag (or enough to fully cover the chicken). Seal each bag while removing the excess air. Put the bags in a baking dish and marinate in the refrigerator 2-4 hours. If you are using a store-bought marinade, follow the directions. Remove the chicken from the marinade and shake off the excess. Starting skin side down, season each side liberally and evenly with the BBQ seasoning. This may seem unnecessary given the marinating, but this adds another layer of flavor and will help give us that lovely colorful skin. Start your fire, or light your gas grill and prepare for indirect cooking at medium-high heat. Of course, this won't really be barbeque without some smoke flavor, and I recommend cherry chunks or chips for poultry. Cook at 300-325º until the thighs reach 165º (about 2 1/2 hours), turning once halfway through. 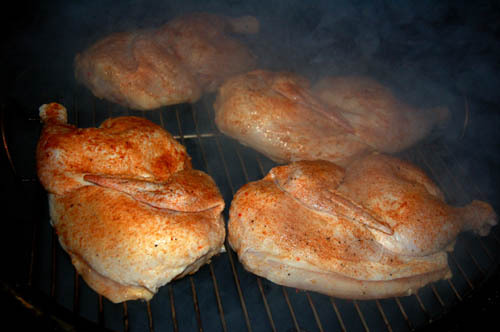 Remove the chicken from the grill/smoker, tent with foil and let rest about 10 minutes. If you're really hungry, plate an entire half, roll up your sleeves and get to work. If not, the breast/wing portion will separate almost effortlessly to make four portions. Sit down and enjoy! I am planning to start doing barbeque sauce reviews as a periodic feature here on the flog (food blog). Well, being a KCBS competitive cook, the first thing to cross my mind is that I need to come up with a fair and consistent tasting method. This lead me to my first mistake. Last night I was at the store and saw some pork chops in the meat department. I had been thinking about the sauce reviews, so I immediately had an idea. I would use simple broiled pork chops as the test vehicle. The idea was that I could fairly easily replicate them using the same seasoning (rub) and cooking process. This would give me a consistent platform for each sauce. Wrong! I broiled four test chops tonight and immediately noticed four things. 2. The results are not consistent, as each chop is different. 3. There is no way to season each chop consistently. 4. There is no smoke flavor in a broiled pork chop. All was not lost, because the same four reasons for failure lead me to the answer I was after. I needed something quick, something consistent, and something that is easy to replicate. Eureka! 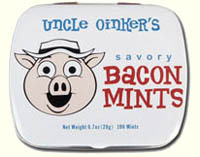 I'll use Lit'l Smokies! There you have it. Look for sauce reviews which will be coming soon. Afterthought: Perhaps BBQ contest reps should give this some thought for their sauce competitions. Today I stumbled upon an electric tabletop smoker/roaster and a "stove top smoker". I'm more than a little uneasy about the whole indoor smoker thing. The idea of listening to screaming smoke alarms for hours just doesn't quite do it for me. However, the first unit might be ideal for someone who wants to do some quick and easy pulled pork. Think of it as a starter pellet cooker. Disclaimer: I haven't tried either of these units. 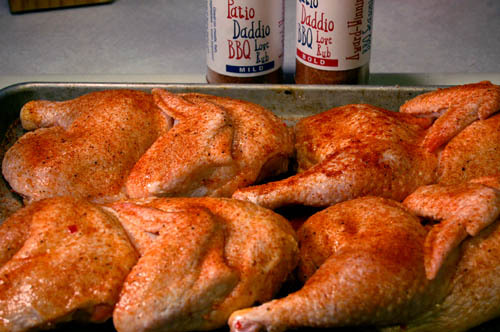 Here is a chicken marinade that is brain-dead easy and will work wonders on your yard bird. There is almost no way to make this any easier. What's great about it is that it tenderizes and adds just enough flavor without overpowering. This also works very well with pork loin and tenderloin. This recipe is enough for two whole chickens and then some, so adjust as necessary. 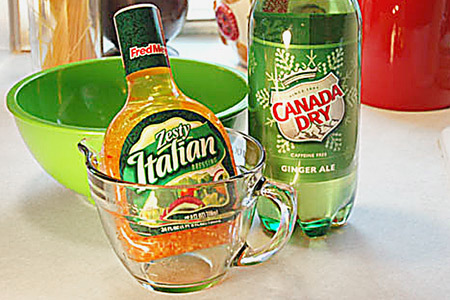 Pour the ginger ale into a large mixing bowl. Add the salad dressing and whisk to combine. 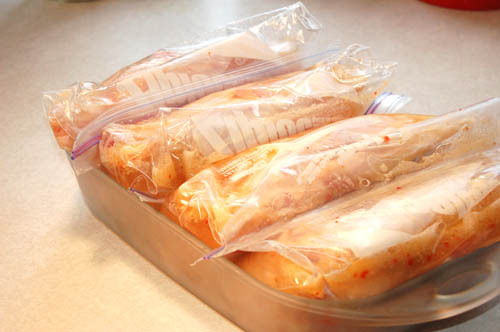 Put your chicken in gallon zip-top bags and add enough marinade to each bag to completely cover the chicken. Seal the bags, removing the excess air. Put the bags in a large pan in the refrigerator and marinate 3-6 hours. Remove the chicken from the marinade and drain. Grill or smoke the chicken as you normally would. Tip: Reserve some of the unused marinade and use it as a baste. Brush it on the meat periodically while cooking. You can use the marinade from the chicken, but you must boil it for five minutes. I ran across this today and was amazed and saddened all at the same time. Do we really need a grilling simulator? Here's an idea... Put down the iPhone, get off the PC, get out of the Spider Man jammies, go to the store, get some meat, bring it home and actually grill it! You get to practice the real thing, and you actually get to eat. Oy! Afterthought: I don't know about you, but my hot dogs don't cook nearly that quickly. Show me someone who doesn't love a great burger and I'll show you someone who is probably soul-deficient. It would be difficult to find a more universally American food than the venerable burger and fries. This roundup of burgers covers the country from Seattle to Boston. Sadly the only places on the list that I've tried are In-N-Out and Fuddruckers. In-N-Out is great, but both times I've tried Fuddruckers (there's a clue) have been disappointing. Each time I left wondering what all the hype was about. Their burgers were overpriced and just okay. As far as national chains are concerned, I'm surprised that Red Robin didn't make the list. Now this is dedication to the quest for pork Valhalla! 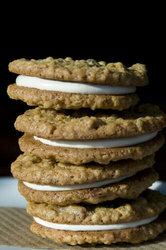 I'm sure most of us remember the cellophane-wrapped oatmeal treats made of two gooey slabs of oatmeal cookie-like material with the infamous mystery vanilla filling in between. Well, Amanda Clarke over at Serious Eats has taken them to an entirely new level. 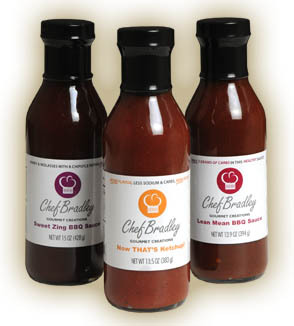 Do you need or want a low-sugar and low-sodium barbeque sauce? Well, Dallas musician and chef, Bradley Balch, may have just what you're after. He started by doing grill duty at musical outings, which eventually led him to culinary school and then to bottling his sauce. 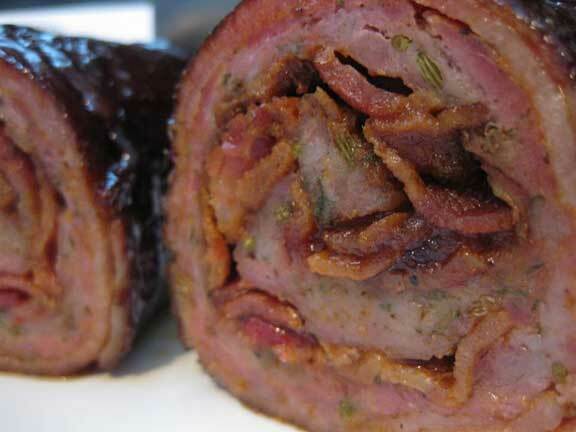 Later, he was challenged by a diabetic friend to, "Make me something that's low-carb." Well, he did, and now you can experience the Splenda-sweetened goodness of his Lean Mean BBQ Sauce. While you're at it, he also offers a low-cal/low-sodium ketchup that might be a great start for creating your own sauce. I've occasionally run across requests for diabetic-friendly sauces on various barbecue internet forums, and it's a very specialized thing, so I thought I'd pass this along. 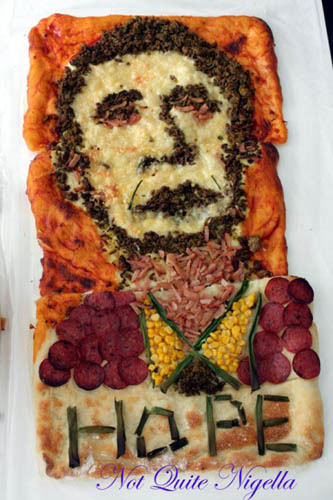 For those that haven't had quite enough of today's Obama-thon, check out this from Not Quite Nigella. If this is the harbinger of things to come, I don't know if I can stand 1459 more days. And here I thought that grilled cheese sandwiches with a Jackson Pollock-ian image of Mary were over the top. Change... It's what's for dinner [for some]. Don't get the door, it's probably a liberal. This needs no introduction. A 2400-calorie appetizer?! These ought to come with prayer cards. When the recipe starts with "place the spareribs in the bottom of a slow cooker", step away from the kitchen. It's really disappointing that Food Network publishes recipes like this. This is the barbeque equivalent to starting starting a story about a romantic date with, "First we hit the drive thru..." It's pretty much irretrievable at that point. The sad thing is that it's not that hard to make decent homemade ribs, even on a gas grill. I think this calls for a how-to article sometime soon. If you really want to cook ribs indoors (and I don't recommend it), here's a recipe that is much better than a slow cooker. Despite the name, these are not competition ribs. Thought: Slow cookers are generally evil. Yes, you read that correctly. An upscale restaurant in Charleston, South Carolina called Tristan features chocolate barbeque sauces. According to the source article at The Cleveland Leader, it comes in three varieties, Chocolate, Chocolate Chili, and Chocolate Pomegranate. I scanned their menus briefly to see what exactly is served under these sauces, but I found no reference to them. Perhaps it's used on specials or in a seasonal menu. Why is it that I can picture a barbecue brisket split in my head? Imagine long banana split bowl with one scoop each of of mashed potatoes, baked beans, and coleslaw. Two slices of brisket would be lying lengthwise on each side the scoops. Finally, the whole thing would be drizzled with the sauce. The sauces can be purchased online. I just watched Iron Chef America for the first time in months. I used to watch it frequently, but alas duty (life) calls. In any event, I was watching the opening where they go through all the pomp and circumstance introducing the challenger chef and the secret ingredient. As the ingredient was introduced and the chefs dashed off, I once again wondered about something that I have many times in the past. If the ingredient is so "secret", how is it that both chefs and their assistants hit the kitchen like their hair is on fire with nary a word about what it is they are going to cook? Everything just starts happening like, well, like they've done it before. Talk about recipes on the fly! I am prepping a chicken stir fry for my daughters and I realized that I have no sauce for it. Well, kitchen resourcefulness kicked in and I literally whipped this up mere moments ago. My girls love both orange chicken and sweet & sour chicken. So, I looked in the fridge, and what did I spy with my big 'ol eye? I saw half a jar of orange marmalade and some orange juice. Here's what happened next. Stir well and use as you would any stir fry sauce. Optional: If you like things spicy, I think about 1/8 tsp of cayenne, or perhaps some Sriracha, would be very good in this. I had to resist the urge to try it for now, as tender tongues await. Afterthoughts: This would probably be a great asian barbeque sauce. I can hear the scoffs of my BBQ buddies now. I should try this on some Korean-style BBQ ribs. Here is a wonderful recipe that I found at The Pioneer Woman Cooks. The recipe and photos are by Kay at Kayotic Kitchen. These two ladies have great cooking sites that feature beautiful photography. This is one of those recipes that you can almost taste as you read it. It's also a great example of how simple ingredients and methods can produce a result that is simultaneously elegant and rustic. Now I'm starting to sound like one of those snooty wine sommeliers. Keep up the good work, Kay and Ree! Give your cow a bath in this and tell me what you think. This is killer for big 'ol steaks or tri-tip. The cola, soy and Worcestershire all act as a tenderizers, while the rest adds serious bold flavor. After marinating you can also use this as a finishing sauce (I'm all about multi-use). Bring a cup or so to a light boil in a sauce pan for five minutes, to kill any nasties and reduce it a little. Brush it on the cow during the last few minutes of cooking. Be careful, the sugar will burn easily. This sauce is also great for grilled portobello mushrooms. You've got a hot grill, so why not? Oh, I almost forgot. Beer makes a great substitute for the cola. It tames the sweetness and boldness down, and still provides the tenderizing. The smell of beer hitting a grill is a beautiful thing. Dump the whole mess in a one gallon zip-top bag, seal and shake well. Add the cow and marinate approximately 1-2 hours per inch of thickness. Try it starting on the low end and add more time as you see fit. Optional: If you're like me and dig spicy food, try tossing in some Tabasco, or your favorite hot sauce. The amount is between you and your taste buds (or taste "bugs" as my six year-old daughter would say). According to the Flavor & The Menu magazine tally of "Top 10 Flavor Trends", barbeque makes the cut as the "Top Concept Trend". I can't say I'm surprised given the huge attention it's received over the past two or three years. A wave of new barbecue restaurants is introducing consumers to more sophisticated interpretations of classic barbecue-shack specialties with a difference - upgraded with signature sides, more interesting preparations and full wine lists and cocktails. This "urban barbecue" approach will offer chefs opportunities to bring barbecue's flavors, techniques and presentations beyond its established boundaries. Here's a no-fuss, hearty meatloaf that is quick and easy to make, and tastes like it took a lot more effort. My goal was to minimize the prep while not compromising flavor. For example, you'll see that I used condensed French onion soup rather than plain onion. 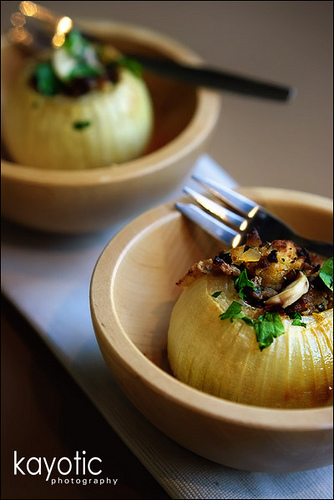 This eliminates the dicing, gives a great rich beefy/onion flavor, and adds moisture. I cooked these over a mix of standard Kingsford charcoal with some chunks of Lazzari mesquite charcoal thrown in for flavor (note the pretty purple flames). The mesquite burns very hot, so you may have to adjust your cooking time if you use just standard charcoal. As sure as I am sitting here someone is going to ask, "That's great, Charcoal Boy, but can I use my gas grill?" Yes you can, but you'll be missing a lot. I'd highly recommend adding a small foil packet of wood chips to the top of your bars/rocks. 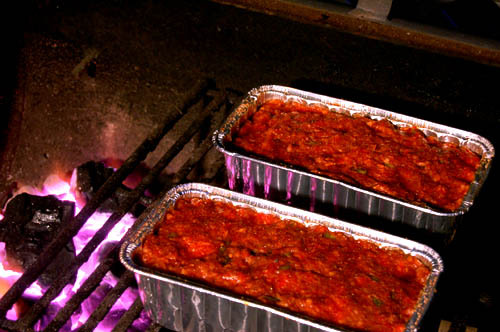 You could also cook them in a 350-degree oven for traditional meatloaf. You'll need to put the foil pans on a wire rack in a sheet pan, and adjust your cooking time. Prepare your grill for indirect cooking over medium-high heat. Poke eight or ten holes in the bottom of each loaf pan with a knife, meat fork, or some other suitable sharp implement. Remove your rings and wash your hands. You should always wash your hands, but it's especially noteworthy here. You'll see why in a just a moment. Put the ground beef in a large mixing bowl and make a well in the center. Add all of the remaining ingredients to the well. Roll up your sleeves and get those hands in that meat muck! There's simply no dainty way do do this. Mix it evenly so that all of the ingredients are well incorporated. Squishing between your fingers works well. Divide the meat mixture evenly into the two loaf pans. Be sure to pack it down to remove any air pockets. Cook indirect on the grill for about 45 minutes. Remove the loaves from their pans, and put them back on the grill. 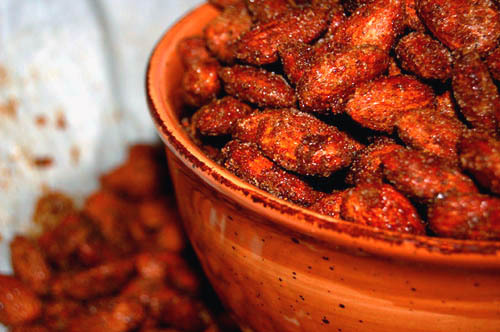 Continue cooking until they reach an internal temperature of 160 degrees. Remove from the grill, put them back in their original loaf pans and let rest 10-15 minutes. Optional: Glaze with your favorite BBQ sauce during the last 10 minutes of cooking. Today a bunch of friends from the Utah BBQ Association honored Marines who recently returned on leave from service in both Iraq and Afghanistan. 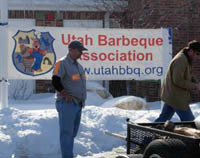 It's estimated that 125 people were served pulled pork, ribs, chicken, sides and dessert. It's times like these that show how special and close BBQ folks are. We compete against each other like warriors then turn around and pool our efforts for great causes such as this. As a fellow veteran, I can confidently say that you've given those troops and their families a show of gratitude that means more than you know. I'm very proud to be associated with this great group. A huge congratulations (and "ooh rah!") are in order for Jonathan Arnold of the 2 Pigs Smokin' BBQ competition team for organizing this event. First the Baconosaurus Egg, and now this?! Yes, let's keep a good thing going. 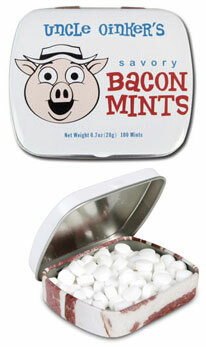 This company gets serious flog (food blog) cred for creativity in my mind. Where else can you find wares like The Bacon Wallet, The Meat Shower Curtain, Meat Pencil Toppers, Sausage Tape, and Bacon Band Aids? Send their Ultimate Bacon and Meat Package to your favorite Vegan or PETA member. Even they will appreciate the creativity. Just make sure you're there when they open it so you can enjoy the look of horror on their face. For the cherry on top, refer them to Genesis 1:28. I'm sure that will give them great comfort. Extra credit: Ask them if they know where one can adopt a potbelly pig. Tell them you're banking carbon credits so you can buy Junior a Prius for graduation. The following quote is from a piece in U.S. News & World Report entitled "How Much Meat Should a Climate Change-Wary Flexitarian Eat?" "We could also, as a nation, just eat a lot less meat as an alternative to full vegetarianism. Anthony McMichael, a leading Australia-based expert on climate change and health issues, has crunched the numbers. He estimates that per capita daily meat consumption would need to drop from about 12 ounces per day in America to 3.1 ounces (with less than half of it red meat) in order to protect the climate." Let me begin by asking, what in creation is a "flexitarian"?! Also, what about the cows? Are they going to decrease their diet of green carbon-based food by 74%? What about the rest of the planet? Oh, I forgot, it's only America that needs to green up around the edges. Perhaps Mr. Tidwell should eat some of the tripe he's serving up at Audubon Magazine. After all, the cow is already dead, right? He can consider it gastrointestinal recycling. Mike, take your soy-induced flatulence somewhere else. No comments?! What's up with that? I'll be very honest. I have comments turned off, not because I don't value your thoughts, opinions and constructive criticism, but because I simply don't have the time to properly moderate them. Being a "do it right or don't do it" kinda guy, I've decided not to do it for now. The blog is brand new and things change. I will re-evaluate as things progress. In the meantime, please feel free to send me any and all of your feedback via e-mail. Just use the the "Contact" link over there on the right. I will make every effort to respond in a timely manner. Again, I value your thoughts. I ran across this today and at first I thought, "Oh, here we go. Some dude is going to pontificate about what I should do." Well, Mr. Bittman did, and I agree (mostly). There are a few things I take issue with, like avoiding aerosol oil and canned beans, but it's generally good advice. How many of us have herbs and spices that have been in our cupboards or pantries since the pleistocene age? Get on the business end of a Hefty and get to work! Don't make me pull this blog over! 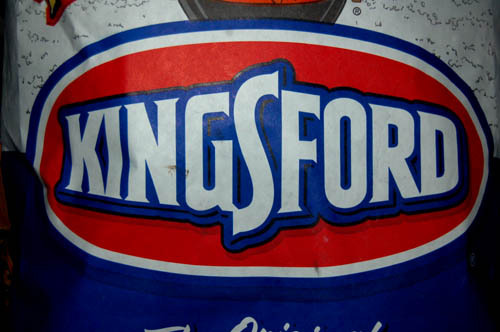 After a flurry of rumors this fall and early winter, today Kingsford announced their new "100 percent natural Kingsford® Competition Briquets" (I'm almost certain they mean "briquettes"). From what I have read and heard, these are simply pressed and formed lump charcoal. I highly suspect that this new product is the Kingsford answer to the very popular Original Charcoal Company "Rancher" briquettes that were available dirt cheap last year at most Home Depot stores. I was a huge fan of the Rancher coal, as were many competitive BBQ cooks. They apparently had a fight on their hands going up against the Clorox behemoth for distribution. I heard a podcast with Chris Lilly last month, who was involved with the R&D, and he seemed excited about this new offering. Of course, I plan to get my hands on some of this ASAP to do a full review. However, it looks like it will be spring before it is widely available. Please e-mail me if you have a chance to try it. Thanks in advance. For those of you that just don't have enough saturated fat and sulfites in your diet, I present to you The Mother of All Porcine Indulgence. I would be very hard pressed to find a way to achieve a higher hog density than this beast. After reading the ingredients, preparation and process, I have to admit that they certainly made great use of the star ingredient. My hat is off to my Burnt Finger BBQ competition brothers. What a wonderful display of pork excessiveness! This thing should come with a Surgeon General's warning, if not a coupon for a free cardiologist visit and cardiogram. This is clearly not for the faint of heart. You might forward this to your favorite supermodel. Do we really need another food blog? Welcome! My name is John Dawson and I'll be your host in this little adventure. Do we really need another food blog? No, but I decided to start one anyway. As the tagline implies, my intention is to offer my thoughts and ideas about food and life. I hope you find it interesting and educational. I suppose I should offer at least a brief introduction of myself. I am a Christian, a husband, the father of three young girls, and an amateur cook living in Boise Idaho. By day I am a senior software engineer specializing in web user interfaces. 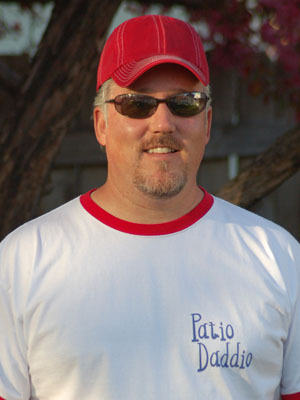 I am a member of the Kansas City Barbeque Society and I've been competing in barbeque competitions since 2006 under the name "Patio Daddio BBQ", thus the blog name. Another reason for starting the blog is simply to make it easier to share my recipes. I'm no Alton Brown, but I am often asked for this or that recipe, or for help with some technique. So, I sort of see this as basically an online cookbook. With that in mind, off we go with the first recipe. Tip: Click the images for a larger view. 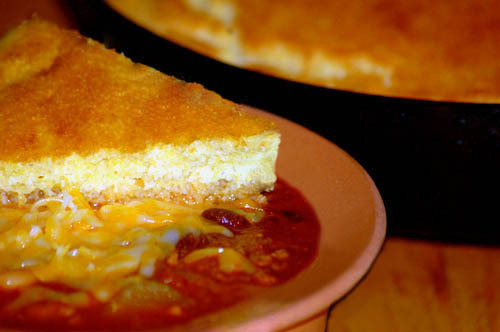 As my first recipe post I have chosen that oh so quintessential American comfort food -- chili. It's winter, and that generally means it's cold and fairly miserable outside. There is something magical about coming in from the cold and smelling that aroma of dinner slowly cooking. It's almost like an airborne appetizer. As an added bonus, you get the peace of knowing dinner is just a bowl and spoon away. I can't count the number of chili concoctions I've created over the years, but this one is a keeper. You know it's a keeper when the family raves about it and your six year old daughter eats two bowls. That alone is enough to warm this dad's heart. There is a point in this recipe where your mind will likely come screeching to a full stop as you re-read the ingredient. Yes, it's coffee. As I was cooking this I had that unmistakable "it just needs something" feeling that all foodies know, and hopefully embrace. I felt it lacked that robust hearty flavor that chili should have. I pondered it for a minute and thought, "Coffee! I'll try that." It gave me just what I was after and the family was completely oblivious. That is often the true test of a quality "it just needs something" solution. In any event, please resist the urge to leave out the coffee, lest you'll be right back to needing something. For you chili purists, yes there are beans, beans, and more beans. I'm originally from northeast Ohio, and that's just how I think chili ought to be. If you are offended, I apologize. Be glad I'm not from Cincinnati where they add cinnamon and spaghetti. Try it under the cover of darkness and let me know what you think. OK, enough waxing philosophical, let's get to it. Brown the ground beef in a large heavy pot over medium-high heat. Do not drain. Add the celery and onion and cook until just the onion is translucent. Add all of the dry ingredients and mix well. Add all of the remaining ingredients and bring to a simmer. Cover and let cook at a low simmer 1-2 hours, stirring occasionally. Serve with cornbread and enjoy. Tip: Dump all of the beans in a colander. Drain and rinse them using your sink sprayer while gently tossing them.